William Pitt and Julia B. Fee Sotheby’s International Realty today announced a brand-new marketing campaign nearly a year in the making, revolving around the mantra “Move Up.” The new print and digital ads are designed to evoke the aspirational aspects of real estate, targeting everyone from buyers to sellers to agents seeking to work with the most exceptional company and brand in the industry. The firm started rolling out the ads in mid-January in all its markets including Westchester County, N.Y., Connecticut and the Berkshires, Mass. 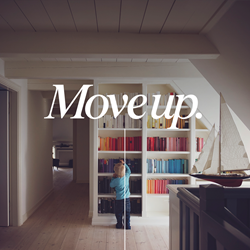 The mantra “Move Up” was chosen for its power to convey the desire among consumers and sales professionals alike to achieve the finest experience in real estate possible, whether a seller wishing to list with a stronger company, a buyer pursuing a better house or a more knowledgeable agent, or a sales expert searching for a more powerful brand. Developed in partnership with the real estate marketing agency 1000watt, the marketing pieces are now appearing in both print and online media outlets, as well as across the company’s multiple social media platforms including Facebook and Instagram. The company has developed a landing page and “Look Book” revealing the heart of the campaign, available to view online here. Founded in 1949, William Pitt and Julia B. Fee Sotheby's International Realty manages a $3.9-billion portfolio with more than 1,000 sales associates in 26 brokerages spanning Connecticut, Massachusetts, and Westchester County, New York. William Pitt and Julia B. Fee Sotheby's International Realty is the largest Sotheby's International Realty(R) affiliate globally and the 31st-largest real estate company by sales volume in the United States. A full-service real estate firm headquartered in Stamford, Connecticut, William Pitt and Julia B. Fee Sotheby's International Realty provides ancillary services including commercial services through its affiliation with Building and Land Technology, a second-generation development company based in Stamford, Connecticut; William Pitt Insurance Services; and an award-winning global relocation division. For more information, visit the website at williampitt.com and juliabfee.com. Sotheby's International Realty's worldwide network includes approximately 20,000 sales associates located in approximately 880 offices throughout 70 countries and territories.